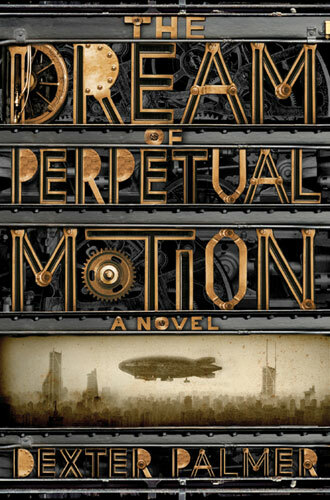 I have to confess that Dexter Palmer’s début novel, The Dream of Perpetual Motion first came to my attention via one of Amazon’s “if you liked…” emails. At the time I couldn’t really find a great deal of information about it but, somehow, it piqued my interest sufficiently for me to give it a go. I’m glad that I did. Things get started with Harold explaining the situation he is in and letting us know that he intends to explain how he got there. This isn’t a particularly revolutionary literary framing device and, indeed, the frequent shifts of narrative style, especially early in the text, won’t necessarily be unfamiliar. That said, they are still unconventional. Half a telephone call, bursts of radio chatter and not-quite-stream-of-consciousness monologues to cab drivers who offer their fares a psychotherapy session as a part of their service all serve to introduce us to the Winslow and describe the world he inhabits. For all that Palmer has created a baroque, alternate view of the past, much is familiar. Many of his characters who grew up before Prospero Taligent’s machines began to change the world (including Winslow’s father) fear that something else has been lost in doing so. This – minus the angels and demons – is something that I’m sure many of us are familiar with. Each generation fears that the new, in sweeping away the old, is not replacing it with something better, rather it is destroying something purer and more wonderful. Winslow’s belief that there are no stories left to be told does, to an extent, betray a certain feeling from the narrator that this may be true. However, in making the attempt to tell his story, it is clear that he harbours at least hope that something beautiful and new can be created. It also betrays a certain conceit from him. In the novel, Winslow is a writer. But he is reduced to writing the text inside greetings cards; something he considers to be below himself, holding the consumers of it to be beneath his contempt and despising himself when he is successful at it. The main interest of the story concerns Winslow’s relationship with Xerovilles (Winslow’s home town) foremost citizen, Prospero Taligent, wealthy inventor of all the mechanical marvels which have transformed the world, and Taligent’s daughter, Miranda. As a boy, gaining an invite to the young Miranda’s birthday party, Prospero allowed him to befriend her and, until his desire to maintain as much of Miranda’s innocence as possible led to him sending Harold back to an ordinary life, they were playmates in the vivid artificial reality that he had created for his daughter. This concern with artifice is carried throughout much of the novel, through Harold’s profession, his sister’s art and Taligent’s attempt to bend the world to his will. Although he was separated from Miranda, Prospero’s promise to him (and others invited to Miranda’s party) that they would receive their hearts desire before they died indicated that their paths would cross again. When they do, it leads to the situation where Harold finds himself with the time to complete his memoirs, living now, as he does on the perpetually aloft zeppelin, The Chrysalis. The story itself is a simple one, albeit one broken up by the more unconventional narrative employed. What impressed me most about the novel was the belief that Palmer has in it. For all that the story itself is a simple one, and that much of the world, for all its science-fantasy setting, is one that we can find much that is familiar, the mastery of language in it ensures that it doesn’t become trite, or clichéd. Indeed, there are moments of blackly comic writing to be found in the novel; not least when Astrid (Winslow’s sister) attempts to create her masterpiece. This, however, I will not spoil for any potential readers. This novel tells us that, while Harold may be right, there are no new stories, it really doesn’t matter if they are told this well. An excellent start from Palmer. I await his next work with interest. This entry was posted in Review and tagged dexter palmer, novel, sf, usa. Bookmark the permalink.